Shown with a single skein of handspun and 2 skeins of Malabrigo Fleece Dyed Merino wool one in a contrast and one in an accent color. This yarn uses 1-2 skeins of Ozark handspun, and 2-4 skeins of malabrigo, depending on the size. For the scarf pictured here, which is narrow and long, purchase 1 handspun and 2 skeins of malabrigo, one in the framing color, and one for the inside solid color. 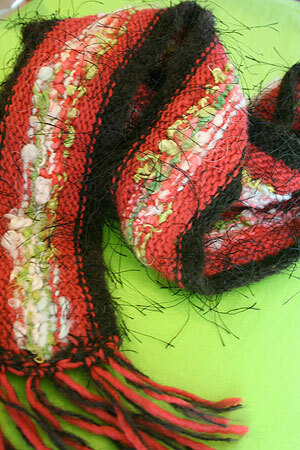 To make a wider scarf, buy 2 skeins handspun, and 2 skeins of malabrigo in each of two colors. Note: This pattern works with any beaded worsted weight and unbeaded worsted weight combo.